First off, I’m very thankful to have three poems up at Drunk in a Midnight Choir. They’re new to me and it’s always exciting to find such a cool new poetry blog. In other amazing science news, scientists at the Large Hadron Collider are probably going to find a parallel world. This is amazing to me because the multiverse and the many-words interpretation of quantam mechanics is a huge part of my sci-fi book, Palimpsest. Basically I now assume that my bad guy is…..you know what…..nevermind. 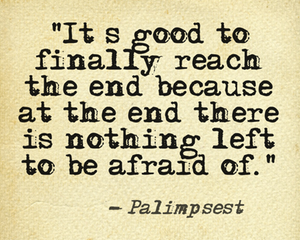 Speaking (or not) of Palimpsest….you know the scifi book that has tortured me for years and years and years and so many words and plot issues and WHAT’S HAPPENING WHAT IS LIFE ANYWAY…..well, I finished. Like really truly finished. 114,714 written and re-written and re-written words later the book is finished. And after I pulled my face up off the floor I put a call out on facebook to see if anyone would be interested in being a beta reader. And the response was wonderful and right now 8 real live people are reading or planning to read this book. So that’s totally exciting. And not at all making me anxious. And while I calmly and not at all nervously wait on their responses, I’ve been putting together the How To Be An American manuscript. I have no idea what I’m doing in terms of order so I thought that if I listed them by subject it might help. Subjects include: sexism, racism, police, Ugly Americans traveling, holidays, family, death, American exceptionalism, suburbia, homophobia and xenophobia. Guess I’ll never be running for president. After that’s done…I don’t know what’s next. Probably the Waterfall book. Though I have been toying with the idea of expanding Vital – the short story set in space that I wrote for my friends Eirik and Monica – into a full story. Really stark. Isolating. Sparse kind of thing. But before all of that, I get to go spend two weeks in Germany and Prague. I can’t freaking wait. I think one of the worst parts of this cancer diagnosis is that I haven’t traveled anywhere in over a year. Not counting trips to family upstate, I’ve been stuck in new york city for a lot longer than I like. And the thing is, traveling is what I DO. The way other people parent or teach or knit or whatever. I travel. I need to travel as much as I need to write. So this trip, will finally feel like a return to the life I used to have before it was ransacked. That will be nice. New normal.